It's snowing in SOUTH GA. Or so the Chief reports gravely. There is, I'm told, white on the grass. The casualties should be tremendous. Beer plus snow plus weekend plus true southerners. I now realize that I have sent the Chief into the SNOWLIGHT ZONE. Aiiiieeee. My family members in north GA are of course used to the white stuff, being hardy mountain folk (by GA standards). So the five or six inches they'll get do not matter - but in south GA, the white stuff is the source of legends and myth, akin to dragons, space aliens and balanced federal budgets. A blizzard for a stage, blowers to act, and snowbound to applaud the roaring savior! It is a little-known fact that you can use good moonshine to rig a flamethrower, although it is a tragic waste. I am afraid to ask. 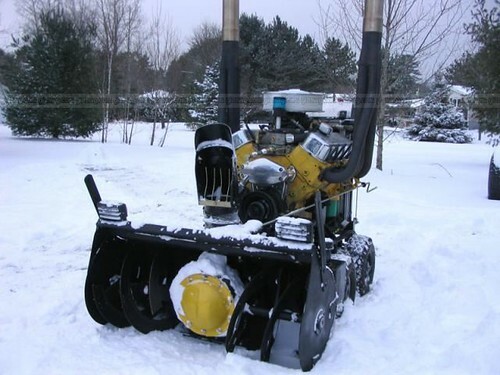 Are snowblowers still made in the United States, and if people buy them, does that help the economy or is it considered an unexpected expense and therefore budget busting? Alesandro - I am no longer up on my engines. It used to be that a few of the higher-end ones were made in the states, but probably no more. At this point, the theory is that we should all spend, spend, spend, so I'm sure buying snow blowers is considered a good thing. If we don't make them here, it just drives up the trade imbalance. Dunno about snowblowers ... but I do know that one of our vendors who does laser-cutting work manufactures components for a US-made snowplow. Heck with that wussy machine...here's what you really need, MoM. 20 Million BTUs!! Railroads have used ducted jet engines like that for snow clearance in yards.